A host is connected to one or more networks that are available to the virtual machines through the corresponding bridges. OpenNebula allows the creation of Virtual Networks by mapping them on top of the physical ones. The underlying physical network infrastructure that will support it, including the network driver. The logical address space available. Addresses associated to a Virtual Network can be IPv4, IPv6, dual stack IPv4-IPv6 or Ethernet. The guest configuration attributes to setup the Virtual Machine network, that may include for example network masks, DNS servers or gateways. NAME to refer this Virtual Network. QoS parameters (optional) for each NIC attached to the network, to limit the inbound/outbound average and peak bandwidths as well as the burst data size that can be transmitted at peak speed (see more details here). 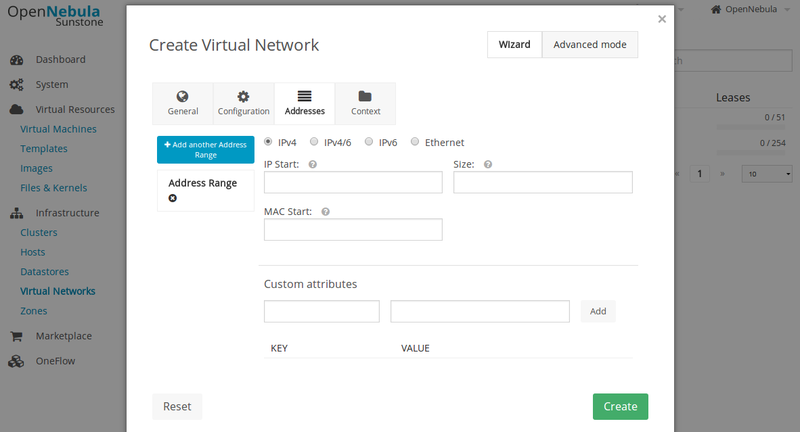 DESCRIPTION = "A private network for VM inter-communication"
This file will create a IPv4 network using VLAN tagging, the VLAN ID in this case is assigned by OpenNebula. The network will lease IPs in the range 10.0.0.150 - 10.0.0.200. Virtual Machines in this network will get a lease in the range and configure DNS servers to 10.0.0.23 and 10.0.0.1 as default gateway. This guide uses the CLI command onevnet, but you can also manage your virtual networks using Sunstone. Select the Network tab, and there you will be able to create and manage your virtual networks in a user friendly way. Creating the network from scratch. Making a reservation from an existing network. End users typically use the last two ways, instantiation and reservation. The administrator can define a network template for being instantiated later by the end user or create a virtual network where the end user can make a reservation from. In the output above, USER is the owner of the network and LEASES the number of addresses assigned to a virtual machine or reserved. DESCRIPTION="A private network for VM inter-communication"
Check the onevnet command help or the reference guide for more options to list the virtual networks. You may have some used IPs in a VNET so you do not want them to be assigned. You can add as many ARs as you need to implement these address gaps. Alternatively you can put address on hold to prevent them to be assigned. ARs can be of SIZE = 1 to define single addresses lease scheme. ARs does not need to be of the same type or belong to the same IP network. To accommodate this use case you can overwrite context attributes in the AR, for example adding attributes like NETWORK_MASK or DNS in the AR definition. Super-netting, you can even combine ARs overwriting the physical attributes, e.g. BRIDGE or VLAN_ID. This way a Virtual Network can be a logical super-net, e.g. DMZ, that can be implemented through multiple VLANs each using a different hypervisor bridge. There are no need to plan all your IP assignment plan beforehand, ARs can be added and modified after the Virtual Network is created, see below. Any attribute corresponding to the context or description. Physical network configuration attributes, e.g. PHYDEV or VLAN_ID. Also the name of the Virtual Network can be changed with onevnet rename command. Addresses are structured in Address Ranges (AR). Address Ranges can be dynamically added or removed from a Virtual Network. In this way, you can easily add new addresses to an existing Virtual Network if the current addresses are exhausted. SIZE, assigned addresses cannot fall outside of the range. Any custom attribute that may override the Virtual Network defaults. Addresses can be temporarily be marked as hold. They are still part of the network, but they will not be assigned to any virtual machine. To do so, use the ‘onevnet hold’ and ‘onevnet release’ commands. By default, the address will be put on hold in all ARs containing it; if you need to hold the IP of a specific AR you can specified it with the ‘-a <AR_ID>’ option. Once the Virtual Networks are setup, they can be made available to users based on access rights and ownership. The preferred way to do so is through Virtual Data Center abstraction. By default, all Virtual Networks are automatically available to the group users. Manual selection: NICs in the VMs are attached to a specific Virtual Network. Automatic selection: Virtual networks are scheduled like other resources needed by the VM (like hosts or datastores). Note that if OpenNebula is not able to obtain a lease from a network the submission will fail. Users can only attach VMs or make reservations from Virtual Networks with USE rights on it. See the Managing Permissions documentation for more information. You can delay the network selection for each NIC in the VM to the deployment phase. In this case the Scheduler will pick the Virtual Network among the available networks in the host selected to deploy the VM. This strategy is useful to prepare generic VM templates that can be deployed in multiple OpenNebula clusters. To set the automatic selection mode, simply add the attribute NETWORK_MODE = "auto" into the NIC attribute. Also you can add SCHED_REQUIREMENTS and SCHED_RANK when this mode is activated. This will let you specify which networks can be used for a specific NIC (SCHED_REQUIREMENTS) and what are you preferences (SCHED_RANK) to select a network among the suitable ones. In this case the scheduler will look for any Virtual Network in the selected cluster with a custom tag TRAFFIC_TYPE to be equal to public and INBOUND_AVG_BW less than 1500. Among all the networks that satisfy these requirements the scheduler will select that with most free leases. You can also use the onevm command using the option --alias alias so that NIC will be attached as an alias, instead of as a NIC. Any attribute supported by a NIC attribute can be also used in an alias except for NETWORK_MODE. A NIC_ALIAS network cannot be automatically selected.